The Wall Street Journal's Environmental Capital Blog has a post on GE CEO Jeffrey Immelt complaining that "U.S. Energy “Policy” Is a Certain Kind of Hell", noting that the barriers to dirty energy are going up while cleantech remains unsupported by the US government, resulting in energy technology companies being left in limbo. His recommendation is for carbon cap and trade to be implemented as soon as possible to end the uncertainty. The chief executive of General Electric has emerged as one of the most outspoken advocates of government caps on carbon emissions. But it’s not that visions of saving the planet are filling his “Ecomagination,” nor has he given up on Hayek. In transforming one of the world’s biggest companies into a clean-tech juggernaut, he just smells the chance to make a lot of money—if the U.S. doesn’t miss the train altogether. “It’s no great thrill for me to do this stuff. I’m not an environmentalist. But if business has no voice, that’s the worst of all worlds,” Jeff Immelt said tonight keynoting The Wall Street Journal’s “ECO:nomics” conference in California. Predictability makes investment planning easier. Clean technology is a huge business for GE already, and only stands to grow, if not in the U.S. then overseas. Renewable energy isn’t just a subsidy baby, subject to the whims of Congress. It’s a multi-billion dollar business for GE around the world. “If the U.S. doesn’t buy my wind turbines, I’ll go to Turkey,” he said. Grist has a more detailed look at the more recalcitrant members of the audience, who clearly didn't like the "ECO" part of "ECO:nomics", noting it isn't company bosses that have a problem with carbon trading - its various conservative ideologues who talk a lot but don't run actual businesses. To reuse one of Margaret Thatcher's phrases - "there is no alternative" (well - there is one alternative, carbon taxes, but I'm sure the skeptics wouldn't view those any more favourably). "I came because I was invited," says the man on stage heatedly, squaring off his shoulders to the packed crowd. "I don't need to be lectured by anybody in this room about how to compete!" From another speaker it might sound defensive, but in this case it is the CEO of GE, the second largest company in the world. Jeff Immelt knows whereof he speaks. Immelt's outburst came toward the end of a Q&A session that saw him repeatedly assailed by ideological conservatives angry over his involvement in the U.S. Climate Action Partnership, a coalition of large businesses lobbying for a carbon cap-and-trade system, and his leadership role in pushing the business world to embrace clean energy and sustainability. First it was Kimberly Strassel, conference co-host and member of WSJ's notoriously hard-right editorial board. He answered her patiently, explaining that it's better for businesses to get out in front of what's coming than wait on the sidelines. Then it was Fred Smith Jr., president of the Competitive Enterprise Institute, who lamented the capitulation of business leaders before the onslaught of Big Government. Immelt smiled tightly, paused, and said, "it's a great country -- we can disagree about this." What put him over the top was Terry Anderson of the Property and Environment Research Center, a right-wing think tank. Anderson asked what real entrepreneurs -- the ones who don't have the resources to lobby for favorable treatment from government -- are supposed to do when a carbon cap cripples the economy. Real entrepreneurs. That set Immelt off. "We compete our asses off," he snapped. "We're No. 1 at what we do!" At points, Immelt seemed keen to let his antagonists know that he was one of them. "We read all the same books!" he said plaintively to Strassel. "I'm not an environmentalist," he insisted later. At the end of one exchange, he protested, "I've never voted for a Democrat!" adding with a mutter, "until tonight, maybe ..."
* The ideologues "worship false idols." There are no completely free markets. The government has its hand in every industry: Housing has mortgage tax credits; GE got into commercial aviation because the DOD helped fund it; in healthcare there's Medicare and Medicaid and the NIH, researching and funding new drugs. Only in energy, for some reason, "we've decided that the only regulation will be the price of a barrel of oil. That's crazy!" * Businesses always forecast doom, but regulations can often work to spur competition. The SOX trading program worked. OSHA 1910 worked. CAFE standards worked. The production tax credits work. About the PTC, Strassel asked, "how many wind turbines would you have sold this year without government subsidies?" Immelt: "The same number. Just outside the U.S."
* Rising energy costs are not some theoretical worry; they're happening. Costs are rising. Better to get out ahead and take control than wait for it to be thrust on you. By the time a law is written, it will be five years too late. * If business doesn't take a seat at the table, regs will be determined by politicians and activists (some of which, he said with evident horror, want to do away with coal entirely!). USCAP may not be perfect, but it replaced a vacuum. Interestingly, criticism from the right came only from pundits and think tankers. Every CEO that addressed Immelt was supportive. Duke Energy CEO Jim Rogers shared an old saying: "The pioneers get the arrows and the settlers get the land." Patricia Woertz of ADM talked about how mission-driven business can attract great employees. H. Lee Scott Jr. of Wal-Mart talked about how odd it is that conservatives oppose programs that are, in effect, reducing waste. The impassioned folks from the Competitive Enterprise Institute are known fans of carbon dioxide, having long claimed it is "good for you", but I'm beginning to wonder if there is actually a mystical element behind the obsession some of the ideological conservatives have with continuing to burn fossil fuels instead of just switching over to clean energy sources and getting on with business. Libertarians have long identified with Prometheus, one of the Titans of Greek mythology, who is best known for stealing fire from the god Zeus and giving it to mortals for their use - thus playing a pivotal role in the early history of mankind. For his trouble Zeus chained him to a rock where his liver was pecked at by vultures, until he was finally rescued by Hercules many years later. * In Ayn Rand's Atlas Shrugged, John Galt is compared to Prometheus: "John Galt is Prometheus who changed his mind. After centuries of being torn by vultures in payment for having brought men the fire of the gods, he broke his chains and he withdrew his fire--until the day men withdraw their vultures." * In Ayn Rand's Anthem, the main character changes his name to Prometheus after being condemned for inventing the light bulb. * Percy Bysshe Shelley's Prometheus Unbound rewrites the lost play of Aeschylus so that Prometheus does not submit to Zeus (Shelley's Jupiter), but supplants him instead in a triumph of the human heart and intellect over tyrannical religion. 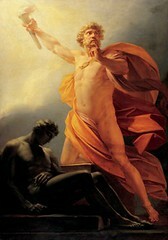 Lord Byron's poem "Prometheus" also portrays the titan as unrepentant. For the Romantics, Prometheus was the rebel who resisted all forms of institutional tyranny epitomized by Zeus -- church, monarch, and patriarch (description from the Wikipedia article). * The Prometheus Institute is a libertarian think tank in the US (albeit one keen to distance itself from Ayn Rand's Objectivists). * The Libertarian Futurist Society sponsors an annual prize for libertarian science fiction called the Prometheus award - though looking at the list of recent winners (including Ken MacLeod, Charlie Stross and Vernor Vinge) it seems they have a different slant on things to the corporate libertarians pestering Jeffrey Immelt or Ron Paul's paleo-libertarians. * There a sculpture of Prometheus outside the Rockefeller Center in New York - GE's headquarters (though it seems Mr Immelt isn't buying into the Prometheus worship any more). Given this strong identification with Prometheus and the fire he gave mankind, perhaps there is some strong subconscious resistance at work in the traditional Libertarian mindset to the idea that we stop setting fire to things - clinging to the practice of burning fossil fuels like polar bears clinging to the last melting pieces of ice cap in the Arctic. This psychological barrier then manifests itself in the form of resistance to doing anything about global warming, or even acknowledging that global warming is occurring, and to the idea that oil production will peak one day - sometimes resulting in the adoption of abiotic oil theory as a way of keeping the fires burning forever. Of course, there is an alternative way of framing the transition that might allay these subconscious fears that we are heading backward into a pre-fire age - instead focusing on the fact that we are moving forward to high technology ways of generating the energy we require - a leap forward, rather than a step backward (and a very popular one at that). Given that the most clean energy sources are driven either directly or indirectly by the sun, perhaps fire worship can be replaced with sun worship over a period of time. Admittedly this isn't the only factor at play - the dislike of regulation obviously plays a huge part (triggered by many activists suggesting heavy handed solutions to both problems) along with a loathing of environmentalists and hippies. There isn't much that can be done about the last one, but coming up with solutions that don't involve endless lists of rules enforced by the government is the best way of overcoming the first barrier - one reason why I prefer carbon taxes (which can be applied along with corresponding income tax cuts, thus ending up with no net loss from your average free marketeers point of view).